Use the VISA® Debit Card instead of writing checks, charging or paying cash at over 24 million locations worldwide. Use it at your favorite restaurant, department store, grocery store, gas station or any other place that accepts VISA®. As with a credit card transaction, you keep a signed receipt of every transaction, but unlike a credit card, the amount of the purchase is deducted automatically from your checking account. In addition to everyday purchases, you can use the VISA® Debit Card with your Personal Identification Number (PIN) as an ATM card at over 1,000,000 ATMs world wide, including over 55,000 fee free ATMs on the Allpoint Network to withdraw money from savings or checking, transfer between accounts or check account balances. VISA® Debit Cards are free to qualifying members and they can be instantly issued from any location. Please contact your credit union’s membership department for more details on the VISA® Debit Card. Please complete this form if you plan to use your credit union Visa Debit or Credit Card while traveling internationally. We can place a travel exemption on the card so that you may use the card. Questions? Call us at 281-487-9333 from 7 AM to 7 PM CST weekdays. Customize your VISA® debit card with almost any digital image, like a picture of your great vacation, to show off to your family and friends. 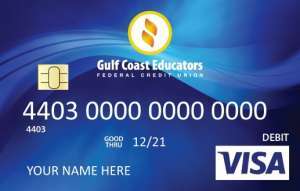 Best of all, it works just like a normal Gulf Coast Educators VISA® Debit Card so you can use it at your favorite restaurant, department store, grocery store, gas station or any other place that accepts VISA®. Click here to start customizing your card today. For lost or stolen credit union VISA® debit card call the credit union main number during business hours and after business hours call 800-472-3272. Your credit union debit card is eligible for Apple Pay. Click here for more details. Visa Checkout protects and simplifies your online shopping experience with a single password, giving you reassurance that only you can use your Visa card online. Your credit union Visa Debit Card is eligible for this program. Learn more or to register your card. Many of you have VISA® Debit Cards and face this question every time you take your card out to use it. Credit or Debit? Your answer will determine how the funds are taken from your account. If you say credit, you will be asked to sign a receipt and the transaction is typically faster. As soon as the transaction is authorized, a hold for that amount will be placed on your account for 3 days or until the transaction clears your account, whichever comes first. This will cause your available balance to be lower by the transaction amount. These transactions are posted each weekday afternoon and the average transaction clears on the second or third day. If you say debit, you will be required to enter your four digit PIN and your wait will be slightly longer. The money will come from your account instantly. If you have any questions about your VISA® Debit Card, please feel free to e-mail us. Know your current account balance. Don’t forget about checks that have not yet cleared your account. Always take sales receipts and carbon copies. Record your transactions in your check register as soon as possible. Remember to include any financial institution fees that may apply. Store your receipts safely in one place in case you need them later. If your card is lost or stolen, contact your financial institution immediately. This reduces your liability if fraud losses occur. Choose a unique PIN. Avoid obvious choices such as your address, phone number, or birth date.